"Top" designer. 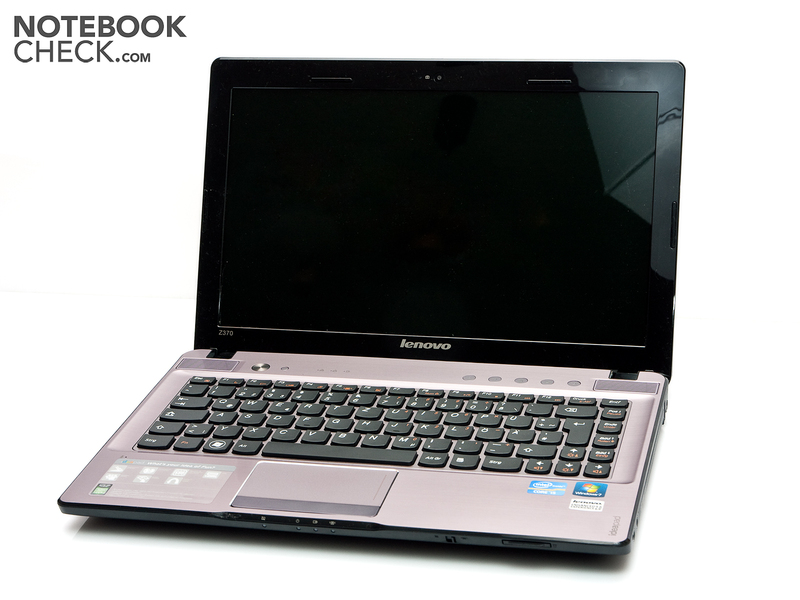 Lenovo supplies a 13 inch subnotebook with the latest second generation Intel Core processors with the IdeaPad Z370. In addition to the hardware, a lot of effort has especially been invested in looks. For example, the notebook has a display lid with 3D effect. Is it after all only straining after effect? Lenovo launches a compact 13.3 inch subnotebook onto the market with the IdeaPad Z370. Lenovo has designed the IdeaPad Z370 according to the idea: "superior elegance can be affordable". But the IdeaPad Z370 not only is to score with its looks, but the latest Intel processors with Sandy Bridge architecture are to ensure sufficient computing power. The list ranges up to a new Core i7 and a 1 TB hard disk. 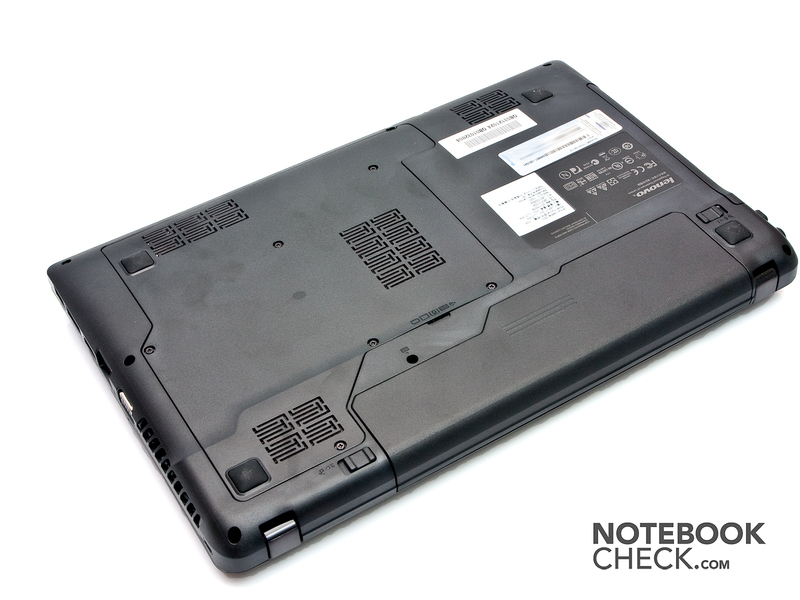 We are looking at the model with an Intel Core i5-2410M and 750 GB hard disk in our review. In addition, there are a lot of special functions installed. 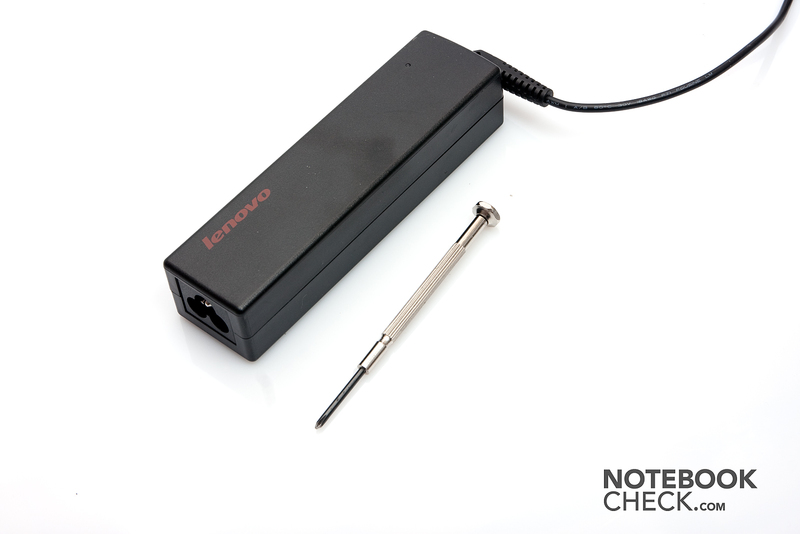 For example, Lenovo treats the IdeaPad Z370 to OneKey Recovery, OneKey Theater and Rapid Boost Technology, among others. If these programs can provide a real added value for the user will have to be seen. Lenovo's advertising text already implies that a lot of value has been placed on the IdeaPad Z370's looks. A lot of effort has been invested in only the display lid. Here, a transparent, metallic and 3D effect has been incorporated. A pattern of small squares is underneath the surface. It becomes more or less visible depending on the angle of view. It is basically a nice effect, but the lid again receives a smooth, glossy surface. In return, it is very sensitive for fingerprints and scratches. Thus, a cleaning cloth is recommended. The display lid yields slightly under pressure and the display is not resistant against twisting, either. However, it didn't cause any color deviations. The hinges aren't pulled particularly tight. 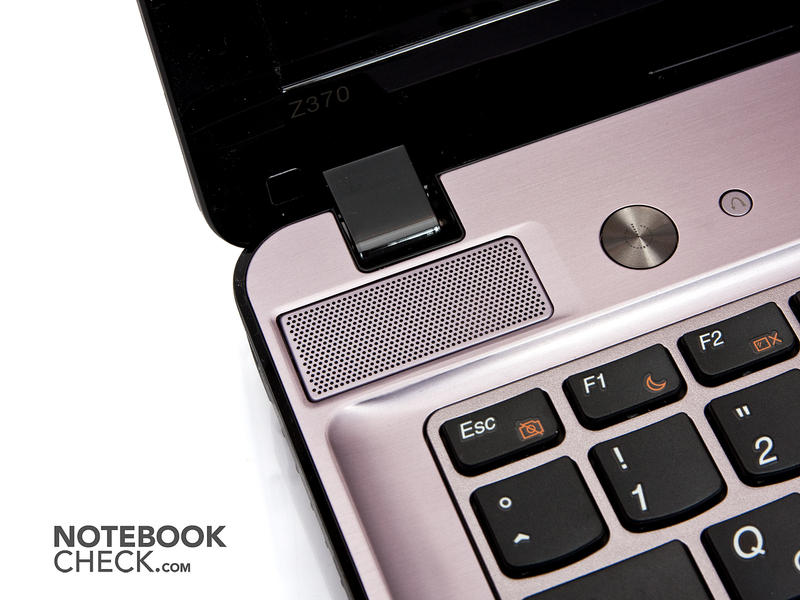 It allows you to open the laptop with only one hand without lifting the base unit at the same time. The display teeters evidently during movements, though. When the display is opened, you see an aluminum surface that covers the entire interior. You can debate about the surface's color – our test device had a slightly pinkish color – but it is resistant against fingerprints and even feels good. The wrist-rest is very pressure resistant and doesn't yield at all even under higher, selective pressure. The keyboard's left also proved to be very stable. However, the stability clearly decreases the more we move toward the optical drive. The keyboard can be depressed by a few millimeters directly over the drive. The surface can also be dented by a few millimeters at the back edge, so over the battery compartment. The notebook's workmanship generally makes a very solid impression. We were pleasantly surprised about the wrist-rest made of aluminum. The gaps are very even for the most part. We could only find slight differences on the keyboard's left and right. The IdeaPad Z370 can be upgraded via a big cover on the bottom. Lenovo gives the user a lot of leniency. If you like, you could even theoretically replace the processor. Unfortunately, Lenovo doesn't install any fast USB 3.0 ports. The notebook has a total of three USB 2.0 ports available instead. One of them is a combined USB 2.0/eSATA port. The interfaces are basically placed so that they won't get in the user's way too much. There are hardly any ports on the laptop's right and the interfaces that are needed more frequently have been moved to the back (USB and power socket). Regrettably, the majority of ports on the left have been placed far front. But they don't get very annoying because most users will sooner have the mouse placed on the notebook's right. There are no interfaces on the rear due to the display's and battery's design. The 5in1 card reader is located on the front. 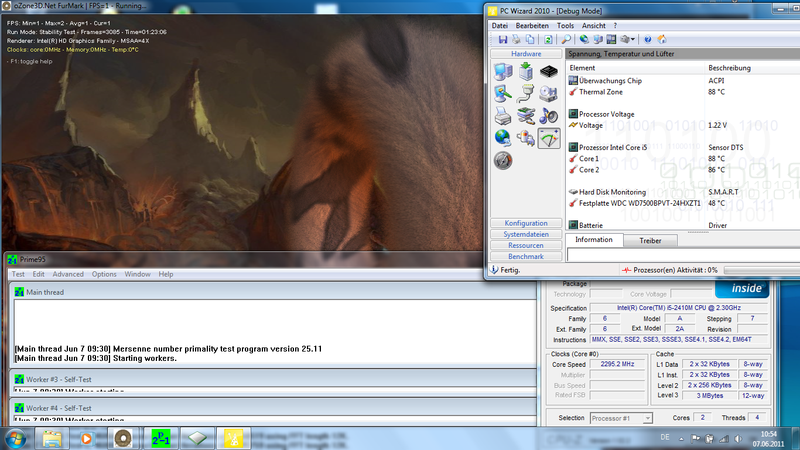 It supports MMC, SD, Memory Stick (Pro) and xD card formats. A dummy card has been inserted for protection. A small switch for turning the wireless technologies on and off is beside the slot. 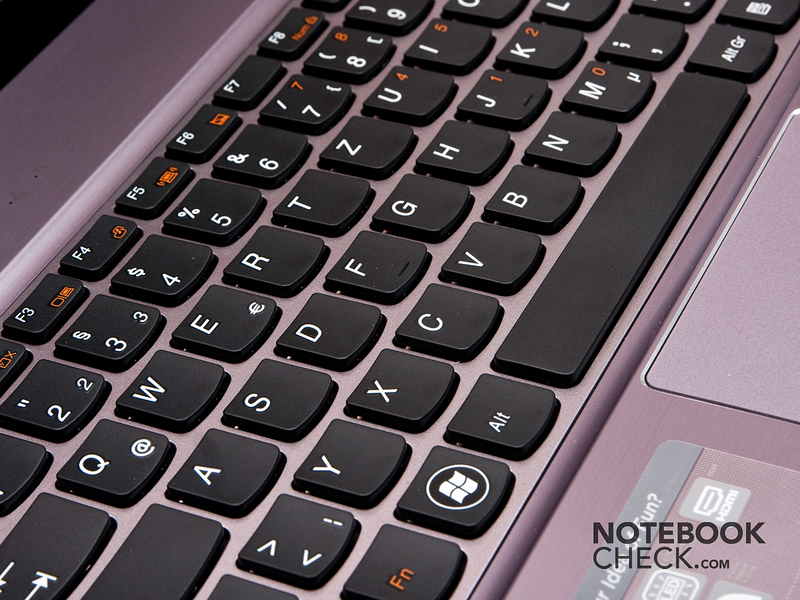 The IdeaPad Z370 practically meets all needs with its wireless technologies. An Atheros AR9285 Wireless Network Adapter card takes care of WLAN connections. It supports 802.11 b/g/n standards. If you prefer to be on the Web via cable, you can fall back on the PCIe Family Controller from Realtek. However, it only delivers speeds of 10 MB/s and 100 MB/s. Gigabit Ethernet is not supported. Bluetooth is also installed, but still in the 2.1 version with EDR and not in its 3.0 version. The scope of delivery isn't very lavish. In addition to the laptop, the battery and the power adapter, you'll find some printed documentation and a warranty card in the box. There are no drivers or recovery DVDs. The system recovery is solved via the OneKey Recovery program. 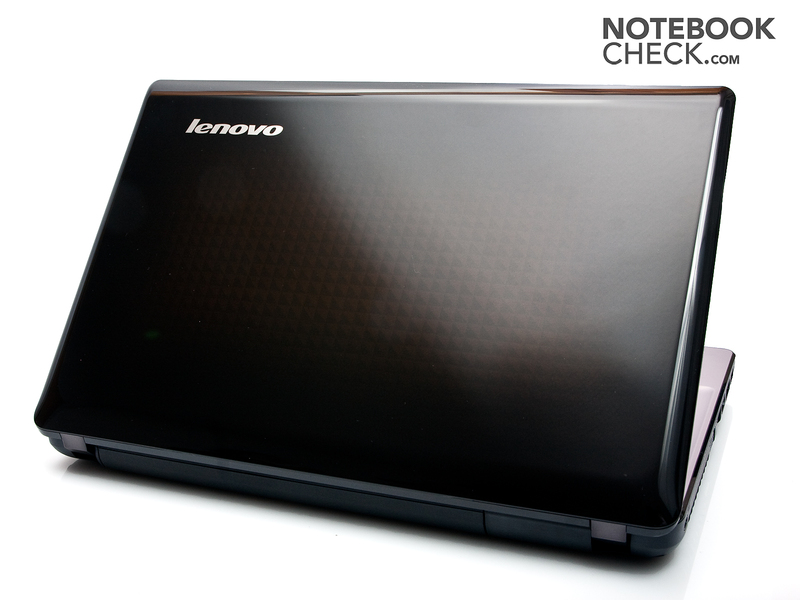 We have already been acquainted with it in previous Lenovo devices and it worked well in them. The Lenovo IdeaPad Z370 comes with a 2 year bring-in service. However, there isn't any further information about the service's period and response time. Lenovo uses an AccuType keyboard for the keyboard. It's basically a keyboard with separated keys, also known as a chiclet keyboard. The single keys have a size of 15x15 millimeters and are slightly conic. That means they have a slight inward curve that is supposed to improve orientation and accuracy. But, only the key distance of 4 millimeters should ensure a sufficient accuracy even without the concavity. We really like the crisp keystroke and the keys convey a very pleasant typing feel. The typing noise is also convincing – it is very unobtrusive and quiet. We have already criticized the keyboard's stability on the right in the section about design, but it is hardly noticed when typing normally. We only notice a bit of yielding when the enter key is hit. There is a row of hot keys above the keyboard. For example, there is a button for volume control on the right above the keyboard. They have been designed as capacitive buttons so that a touch is sufficient to trigger the desired effect. 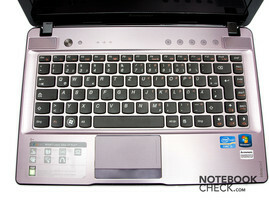 A big power button is located above the keyboard's left, as well as the, rightly small sized, OneKey Recovery button. Lenovo gives the IdeaPad Z370 a multi-touchpad with a diagonal of 95 millimeters (42 millimeters x 85 millimeters). 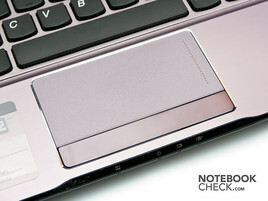 The touchpad is in a cavity on the wrist-rest. Consequently, the pad's limits are clearly defined. 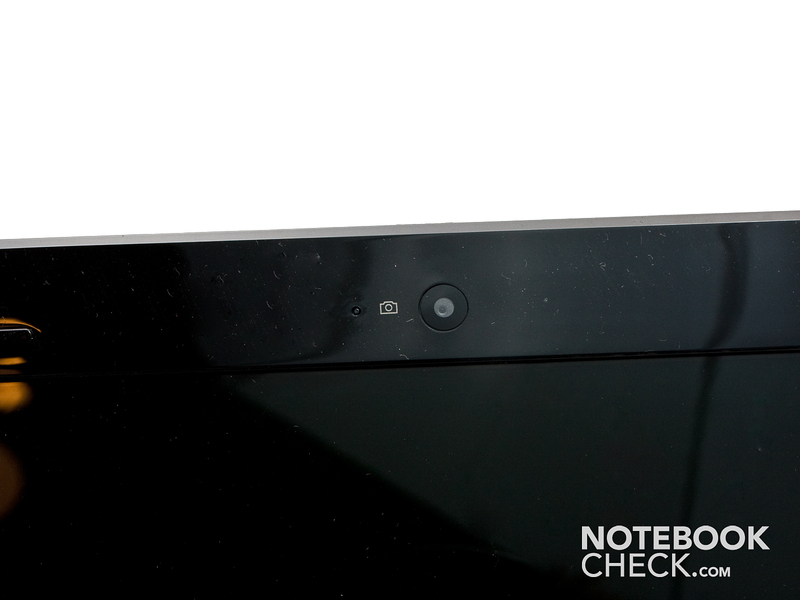 The touchpad's surface has been roughened slightly and has been given a dotted texture. This is to contribute to the touchpad's accuracy. There is a vertical scroll bar on the right, as well. The horizontal scroll bar is standardly disabled. Multi-touch also works perfectly and allowed us to scroll through documents and websites or zoom in on pictures with ease. Overall, you can work well with the touchpad. Both mouse keys have been designed as a rocker and are made of one big key. The keys' drop has turned out rather short, but isn't disturbing, either. You can also work properly with both touchpad keys. Lenovo installs a 13.3 inch screen with a resolution of 1366x768 pixels into the IdeaPad Z370. It is a display with a glare type surface and LED backlight. The latter has likely become a matter of good form, just like the aspect ratio of 16:9 in laptop displays in the meantime. The brightness of the display built into the IdeaPad Z370 isn't outstanding. 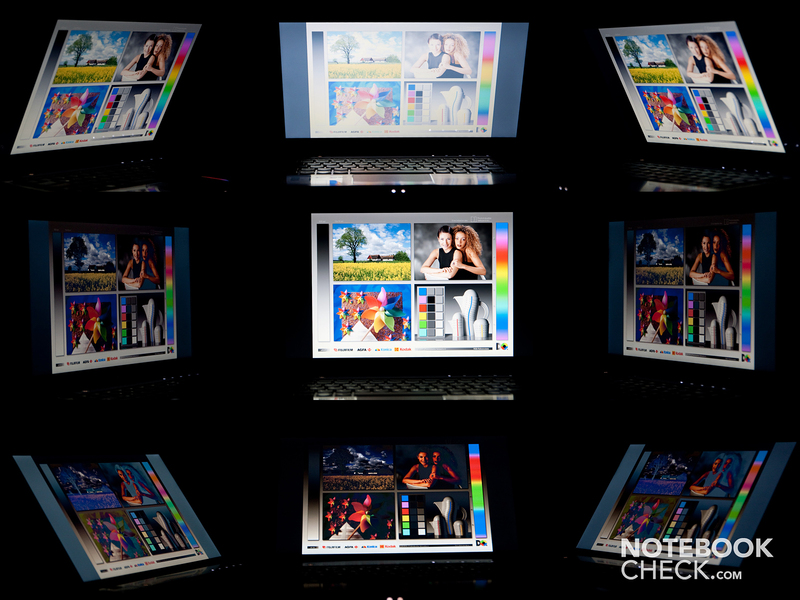 The IdeaPad Z370's display sooner places itself in the broad midfield of tested notebook displays with a maximum measured brightness of 197 cd/m2 and an average brightness of 186 cd/m2. The screen's even illumination has to be pointed out positively, though. It is very good with 92%. The black value and contrast ratio aren't as impressive. While the black value of 1.18 cd/m2 is too high, the contrast turns out very low with 157:1 as a direct consequence. This especially has an adverse effect on games, movies and outdoor use. While dark areas look more gray than black in games and movies, the poor contrast reduces legibility in sunlight. 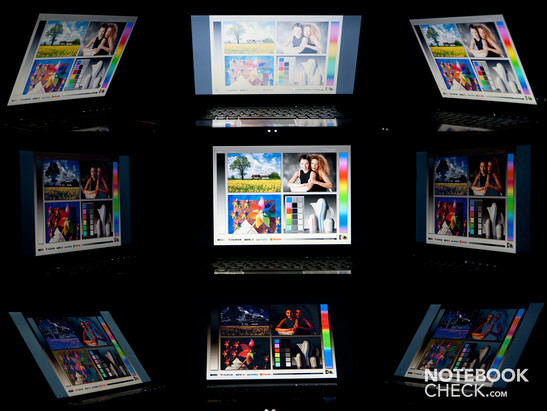 In regard to color reproduction, Lenovo uses a typical representative of budget office and multimedia notebooks that lacks an extended color spectrum. The display contents' legibility suffers greatly under the low contrast and, in particular, reflective surface during outdoor use. It is partly impossible to recognize anything on the screen, depending on the viewing angle. And even if you can see something, it quickly gets tiresome, for example reading tests. You should rather look around for a shady place in the summer or – even better – a room indoors. The Lenovo IdeaPad Z370's viewing angle stability is about in accordance to that of the majority of the latest laptops has to offer. The viewing angle stability is still adequate horizontally, even in more narrow angles, and the picture first changes fairly late. The vertical plane isn't quite as good. The picture fades fast and is consequently almost illegible. 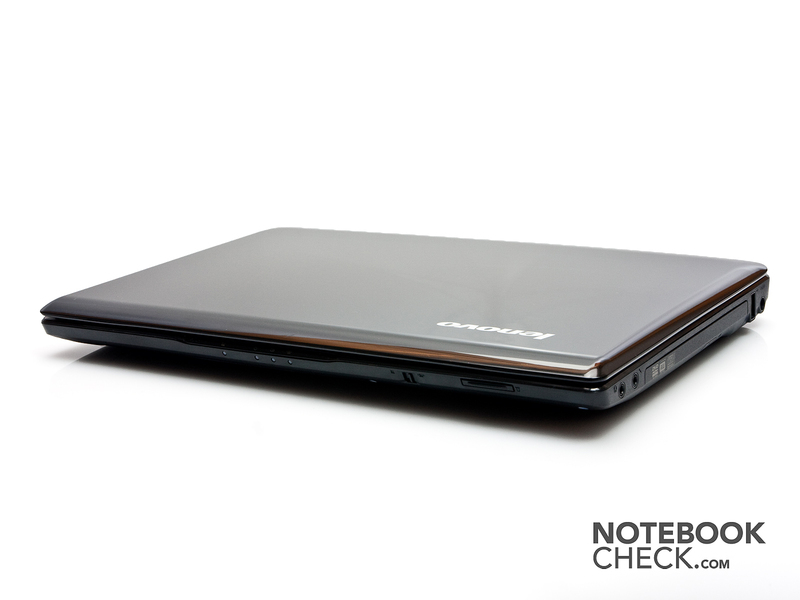 A Core i5-2410M from Intel does its job inside the Lenovo IdeaPad Z370. It is a midrange dual core processor from the second generation of Core processors. The processor isn’t exactly weak ex-factory with a clock rate of 2.3 GHz. Even more performance reserves can be mobilized in case of situations with a higher power requirement thanks to Turbo Boost 2.0 – providing that the processor is sufficiently cooled. 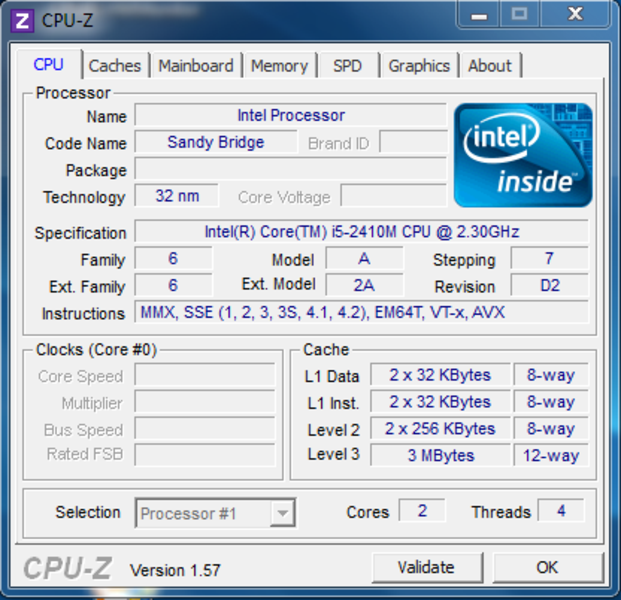 The clock rate can be increased to 2.6 GHz (2 cores loaded), or 2.9 GHz (1 core). The 2410M processor can even compete with the much faster clocked predecessor, Core i5-560M with 2.7-3.2 GHz, due to the optimized architecture. The 2410M is partly even faster than the 560M. Moreover, the 2410M processor incorporates the entry level graphics and memory controller. The graphics card is an Intel HD Graphics 3000 graphics card, which has primarily been designed for office applications and light multimedia tasks (media rendering). Basically, the Intel Core i5-2410M processor is a good all-rounder that can cover a wide field of daily applications. The IdeaPad Z370 only uses the Intel HD Graphics 3000 incorporated into the processor for the graphics. Thus, the notebook doesn't exactly supply abundant graphics performance. The Intel graphics card should primarily cover basic fields though, and use as little power as possible while doing so. Although modern, incorporated graphic cards are a bit more powerful (compared to their predecessor models), the latest games either can't be played at all, or can only be played smoothly in low details. The main field of application for the graphics card lies in Internet and office tasks anyway. In our first benchmark, the Cinebench R10 Single Rendering (64bit) benchmark, the Lenovo IdeaPad Z370 achieves 4449.0 points. Thus, the laptop is still in the upper third of our benchmark chart. 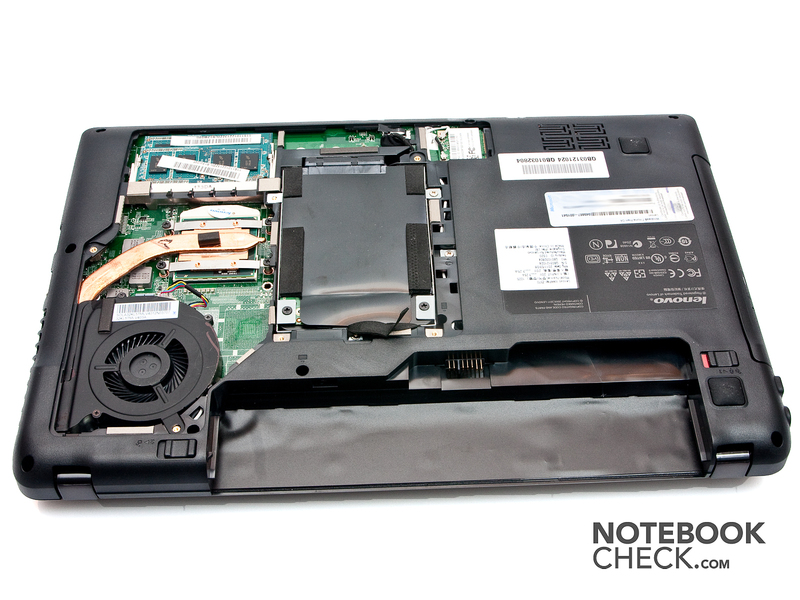 The recently reviewed Dell Vostro 3450 (2410M, HD6630M) laptop is just before the IdeaPad Z370 with 4450.0 points. In comparison, the 2011 13 inch MacBook Pro (2415M, HD Graphics 3000) reaches 4607.0 points with a somewhat stronger processor. 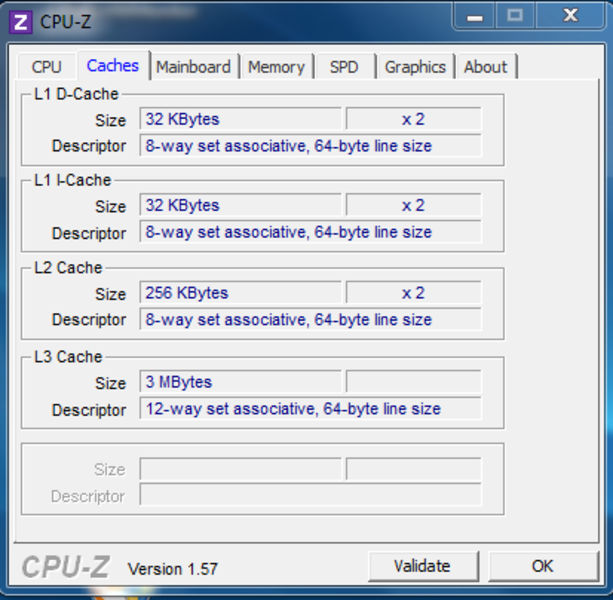 The IdeaPad Z370 is again in the upper third of the chart in Cinebench R10 Multi Rendering (64bit). With 9574.0 points, the IdeaPad Z370 is a lot closer to the 13 inch MacBook Pro (2415M, HD Graphics 3000). The MacBook is now only a few points in front of the IdeaPad Z370 with 9634.0 points. 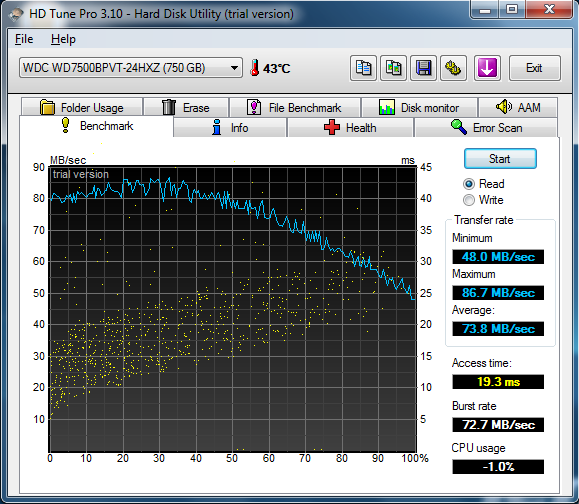 Both notebooks are surpassed by Dell's Vostro 3450 (2410M, HD6630M) with 9699.0 points this time. Another 13 inch representative comes into play as the Acer Aspire 3830TG-2414G75nbb (2410M, GT 540M). 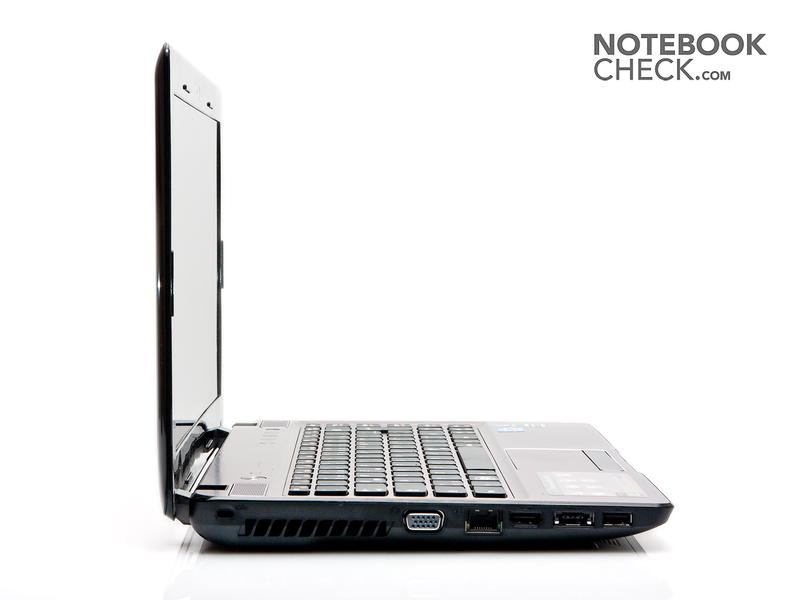 The Acer is amidst the aforementioned notebooks and achieves 9651.0 points. 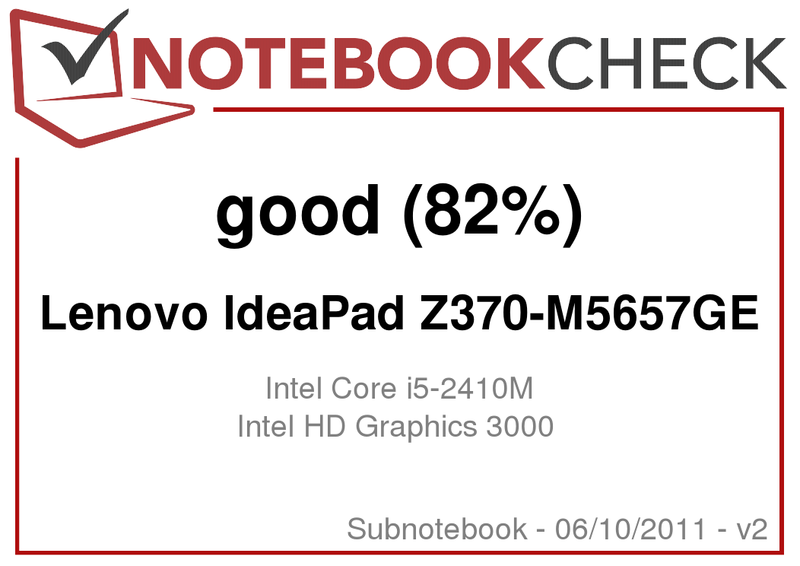 The Lenovo IdeaPad Z370 achieves 5937.0 points in PCMark Vantage's total score. Thus, the IdeaPad Z370 is only slightly behind the Acer Aspire 4830TG (2410M, HD Graphics 3000) with 5980.0 points. The 13 inch MacBook Pro (2415M, HD Graphics 3000) is again in front of the IdeaPad Z370 with 6009.0 points. The IdeaPad Z370 doesn't score particularly well in the 3DMark06 benchmark due to the Intel HD Graphics 3000. The system only just reaches 4589.0 points, here. Thus, it is in the lower half of our benchmark chart. However, the opponents don't do much better. The 13 inch MacBook Pro (2620M, HD Graphics 3000) lags behind the IdeaPad Z370 with 3790.0 points. First devices with a dedicated graphics unit, such as the 13 inch Sony Z13Z (GT 330M) can score better here and thus also come in question for multimedia pros. The 2.5 inch hard disk installed into the IdeaPad Z370 comes from Western Digital and has a (gross) capacity of 750 GB. The magnetic disks in the hard disk rotate with a speed of 5400 rpm. 750 GB is a lot of memory capacity and will suffice most users. Apart from that, the hard disk can't excel with its rates. They are in the midfield of current 2.5 inch hard disks. The average transfer rate of 73.8 MB/s and the access time of 19.3 ms are rates that many other hard disks of this price range reach. In order to assess the gaming suitability, we again used the real time strategy game StarCraft 2: Wings of Liberty. Since the Lenovo IdeaPad Z370 isn't a gaming machine, we will only deal very briefly with the field of gaming here. If you would like more information about which games run on the Intel Graphics 3000, you can look closer at our big comparison "Computer Games on Laptop Graphics Cards". StarCraft 2 only runs in exactly one mode smoothly, and that is the lowest resolution with the lowest details (1024x768, all set to low). We achieved playable rates with 56 frames per second. Higher settings are penalized with collapsing frame rates right away. As already described in the performance section, the Intel Graphics 3000 isn't really suitable for gaming. So if you'd like to play a game more frequently, you should really look around for a stronger graphics solution. Basically the IdeaPad Z370 sooner belongs to the quiet sort of laptops. 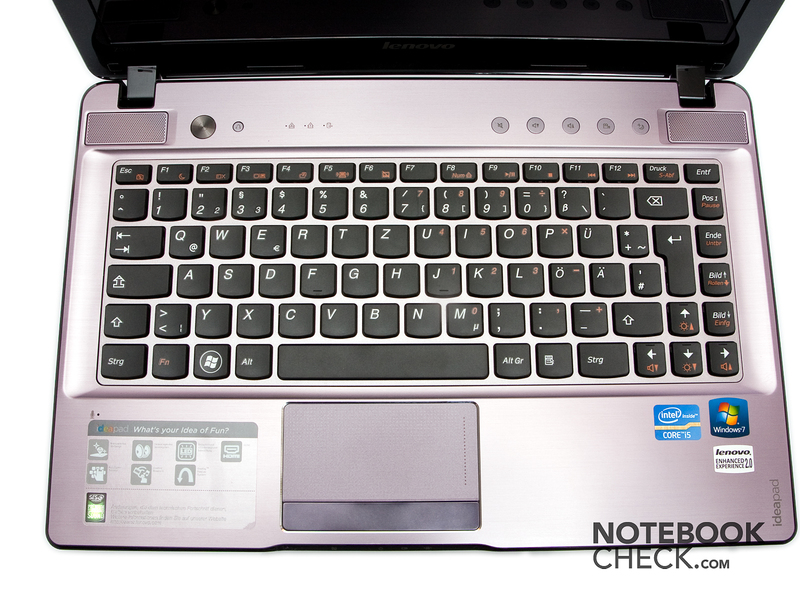 In idle, respectively during light load, the notebook's noise level is 31.5 dB(A) – 31.7 dB(A). Thus, the laptop is audible, but it's not particularly obtrusive. 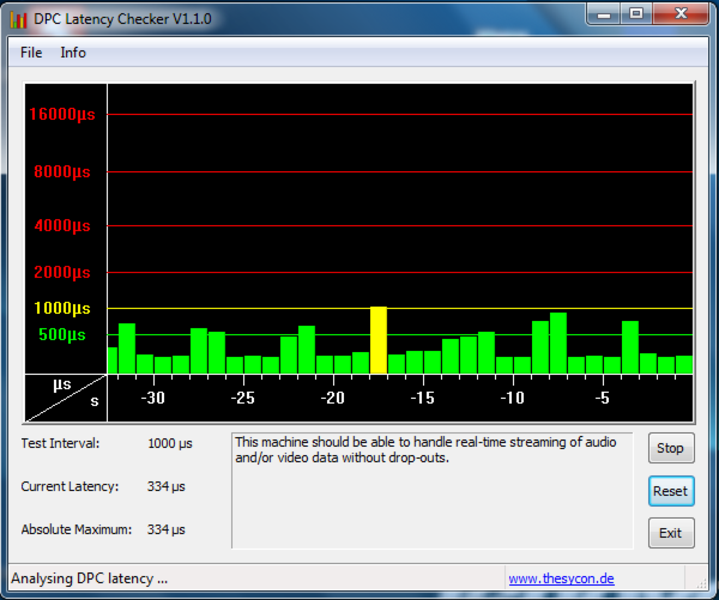 It's enough to insert a CD or DVD into the optical drive to let the noise level increase to 37.2 dB(A). The noise level also clearly increases during high load. The cooling system has enough to do and the fan has to be turned up. The noise level now reaches rates of 36.3 – 42.8 dB(A). The notebook is very audible in this condition and can be described as annoying in the long run. As expected, the temperatures stay within limits in idle mode. The surface is within an acceptable range with a maximum of 26 degrees. The wrist-rest is clearly in an acceptable field with 24.7 degrees Celsius (left) and 25.3 degrees Celsius (right). You don't even notice the slight temperature increase in practical use. The touchpad's 26 degrees Celsius can also be neglected. The notebook's bottom is a bit warmer with 30.2 degrees Celsius, but this rate is also within an acceptable range. The temperatures increase during load, but the cooling system keeps them under control. The top heats up to a maximum of 35.8 degrees Celsius. This temperature is only reached on the rear left area, directly above the vent, though. The wrist-rest temperature increases to 31.2 degrees Celsius (left) and 26.6 degrees Celsius (right). 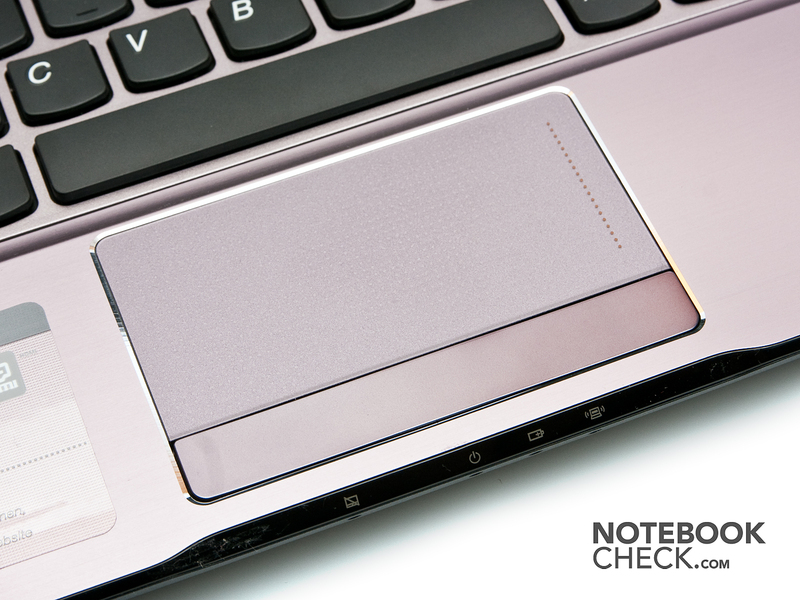 The touchpad heats up to 31.2 degrees Celsius. The bottom now reaches a maximum temperature of 45.1 degrees Celsius. Here, the warmest area is again found in the vent's area. Overall, the average temperature of 32.7 degrees Celsius is not alarming. Using the laptop on the lap shouldn't be a problem either. It might only get unpleasant in the summer in higher ambient temperatures and in shorts. We run the programs Prime95 and Furmark in our simulated full load mode in order to load the processor and graphics card as high as possible (about 100%). We used the program PC Wizard to readout the notebook's temperatures. But it has to be made clear that tools like PC Wizard can't supply any exact rates. Thus, the approximate rates should be interpreted as a rough reference value. According to PC Wizard, the processor reaches a maximum temperature of 86 degrees Celsius. Thus, the maximum temperature is still within an acceptable field. The IdeaPad Z370 however only reaches 3590 points in the successive 3DMark06. That is about 1000 points less than in the "cold" state. Apparently, these are the first signs for a temperature induced limitation of the Intel CPU's turbo mode. Since all other benchmark tests stay within the expected field, no restrictions should be anticipated in this regard during normal use. (+) The average temperature for the upper side under maximal load is 30.2 °C / 86 F, compared to the average of 30.7 °C / 87 F for the devices in the class Subnotebook. Lenovo advertises with an "outstanding sound system" installed into the IdeaPad Z370. This sound system consists of two 1.5 watt speakers that are located in front of the display hinges. The sound isn't quite as outstanding as Lenovo heralds its sound system to be, but in comparison to other laptops of this price range, it is superior. 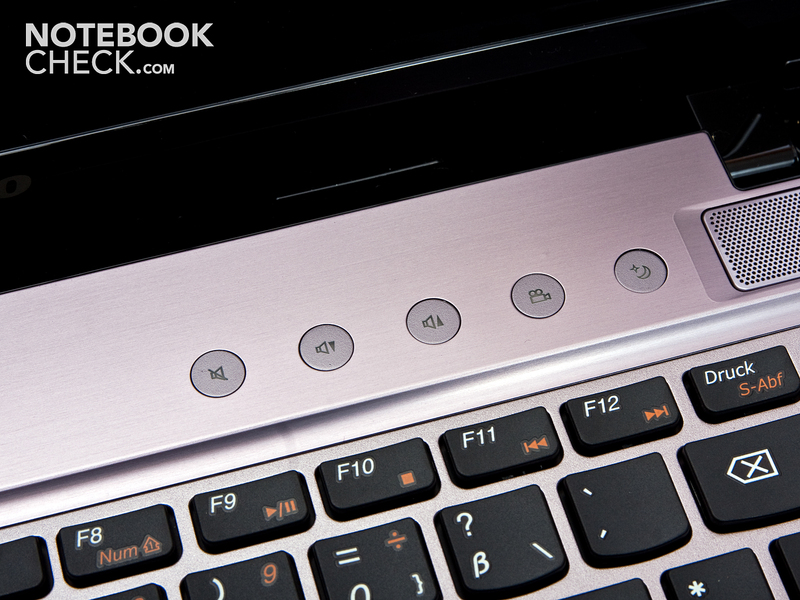 The IdeaPad Z370 is remote from multimedia notebooks that have an extra subwoofer built-in. The IdeaPad Z370's sound simply lacks the necessary volume for this. 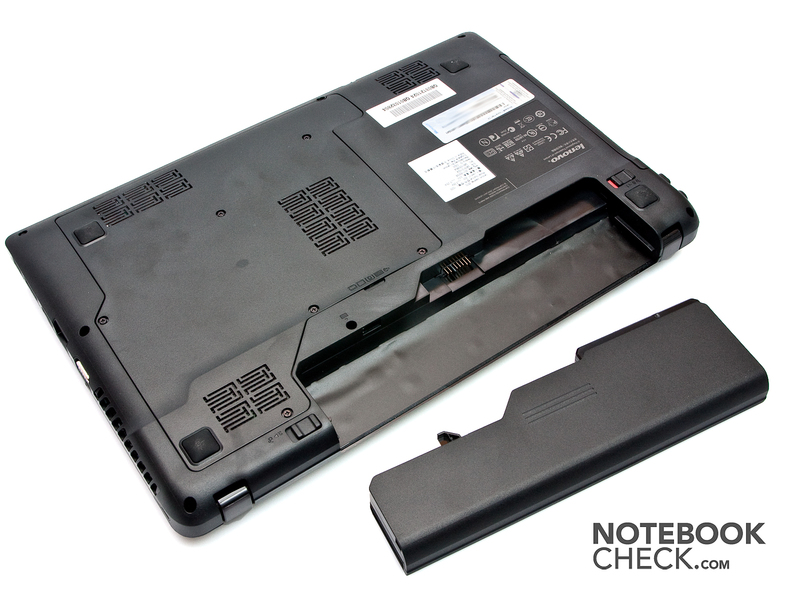 The Lenovo IdeaPad Z370 reaches good battery runtimes despite its not very big 6 cell battery. We again use the software, BatteryEater Pro, for testing. The laptop achieves a runtime of 6 hours and 25 minutes in the Reader's Test (simulates idle). 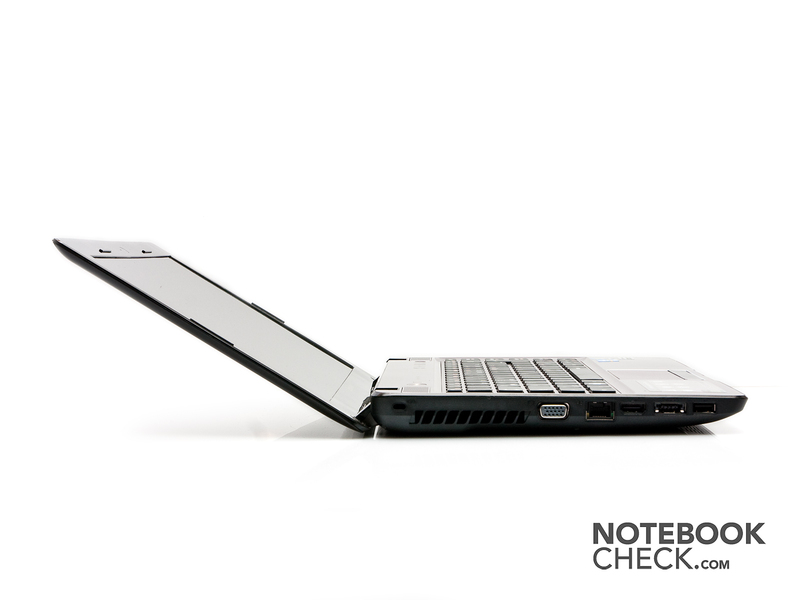 The notebook clearly benefits from the numerous energy saving options of Intel's hardware. However, when it's put under load, namely Classic Test (simulates load), the runtime sinks to about one hour (67 minutes). The battery's low capacity is noticed in this case. You can at least still reach a battery life of a bit over 3 hours when you only surf wirelessly on the Internet. This is also roughly the time you have to watch DVDs on the go. A complete recharge of the drained battery takes almost 2 hours (1 hour 56 minutes). At first, the IdeaPad Z370's consumption rates seem to be low. However, when we compare them with other subnotebooks, it's clear that less is possible. While the IdeaPad Z370 consumes 9.8 watts – 12.1 watts in idle, the Acer Aspire 3830GT (2410M, GT 540M) only needs 5.7 watts – 9.3 watts. In return, the IdeaPad Z370 can score with a low maximum consumption. 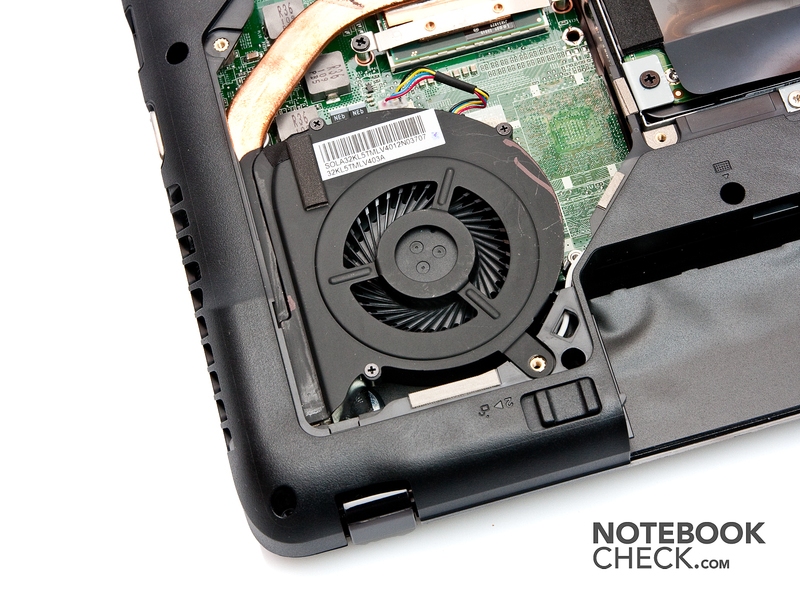 42.5 watts – 58.9 watts are rates that other notebooks can only dream of. But they usually also have stronger hardware. Lenovo presents an interesting 13 inch subnotebook in the IdeaPad Z370. Basically, we liked the notebook's design. But, as known, taste is a personal matter and the pink interior will especially be cause for the one or other difference of opinion. The manufacturing quality can be called good without debate, though. It doesn't clatter, everything fits tight where it belongs and the gaps are also all right. However, it can't hold a candle to a Dell Vostro or MacBook Pro. The Z370 does its job without excelling in terms of performance. The processor, as well as the incorporated graphics card, performs as expected (except for the possible throttling during full load, which should hardly have an impact on practical use). It is primarily suitable for a mixed office/multimedia use, whereas games should sooner be excluded. The feasible battery runtimes and the acceptable price also speak for the laptop. So, if you are looking for a portable notebook with adequate battery runtimes and a good start price, you could very well find satisfaction with the IdeaPad Z370. But high performance shouldn't be expected from it. The fan blows the warm air out of the notebook. allows accessing almost all components. The IdeaPad Z370 from its other side. The capacitive control buttons are above the keyboard's right. The hinges aren't pulled very tight and can't prevent the lid from teetering. We like the keyboard, but it unfortunately yields a bit towards the optical drive. The display's opening angle isn't particularly wide. 3D effects on the lid. The adapter has been made pleasantly small and light. We like the attractively designed display lid with 3D effect and the pleasant keyboard that has been installed in the IdeaPad Z370. The latest USB 3.0 port would have looked good on the IdeaPad Z370 and have made it complete. Competition comes from, for example, Acer and would be the 13 inch Acer Aspire 3830TG. It has the same processor, but a stronger graphics card, which makes it more expensive than the Lenovo. If you'd rather have a matt screen and are willing to pay a bit more, you might find this in Dell's Vostro 3350. Dell additionally installs a stronger graphics card besides the matt display.